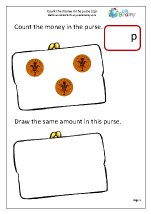 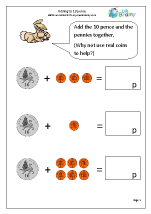 At first children will count using 1p and 2p coins to make totals up to 10p. 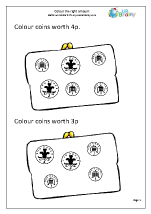 Later the 5p and 10p coin can be introduced. 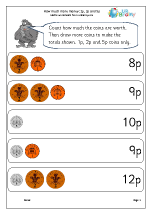 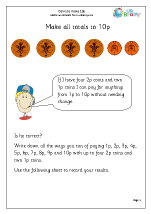 Solving simple problems, such as finding more coins to make 10p, can be done practically. 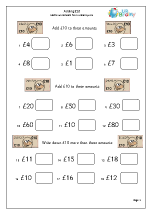 As confidence grows totals up to 20p can be used. 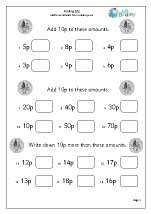 A great way to work out the correct change is by counting on from the price to the amount given in payment, handing the coins over as you count on. 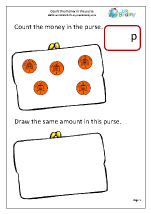 Subtraction by counting on can also be found in our subtraction category. 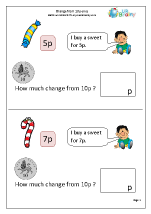 Once again nothing beats practical work using coins to buy small items in a shop. 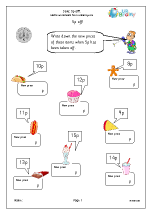 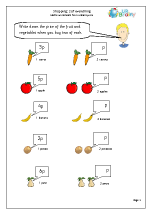 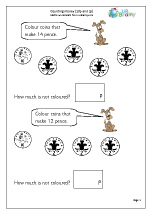 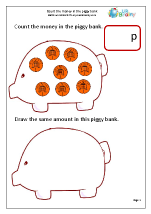 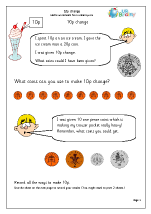 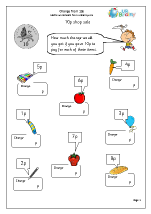 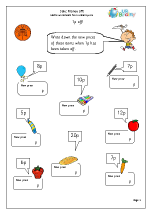 Beginning with buying two or more items costing small amounts such as 4p or 5p, by the end of the year children will be working with 10p pieces. 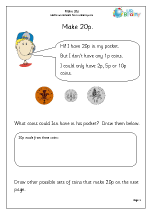 Lots to do here, including adding using coins and notes, finding change and investigations. 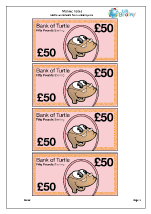 Our lovely turtle notes are carefully designed to help with adding £5, £10, £20 and £50. 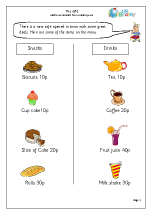 Using whole pounds in the cafe. 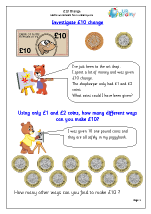 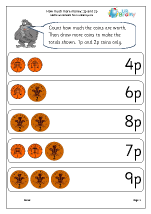 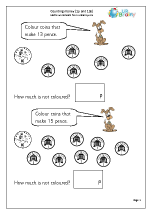 This is a really practical topic, so why not get out the coins and use them to count up, including counting mixed coins of 1p, 2p, 5p, 10p and 20p. 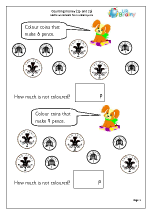 When confident with counting coins then move on to shopping and giving change. 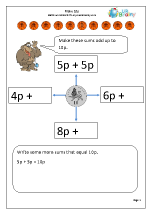 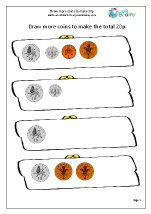 Counting notes has now been introduced to the year 1 curriculum so why not use our great turtle notes to help count in fives, tens, twenties and fifties? 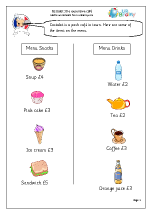 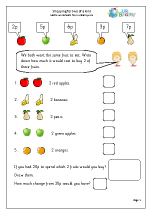 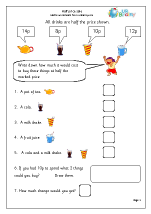 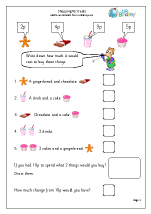 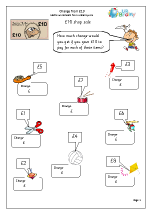 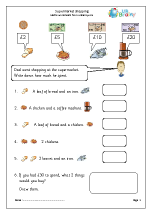 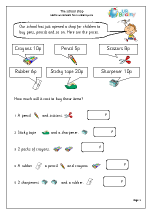 We have lots of colourful counting money worksheets and shopping questions, but it is also well worth having your own little shop where small items can be 'bought and sold'.